The Roland TM-2 Trigger Module is a portable yet powerful electronic drum module which bridges the gap between acoustic and electronic drum .. 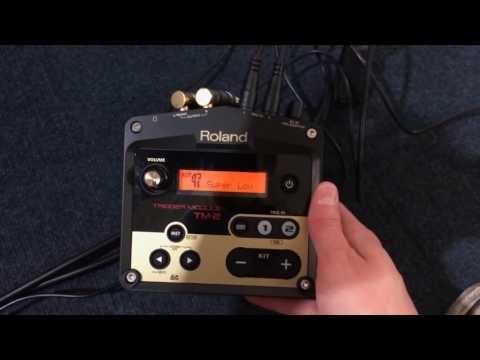 The Roland TM-2 Trigger Module is a portable yet powerful electronic drum module which bridges the gap between acoustic and electronic drum kits to give drummers 'the best of both worlds'! Featuring 100 ready-to-play, professional sounds, it allows you to quickly scan through a range of percussion, electronic and acoustic sounds to integrate within your current rig for dynamic performances. For simplicity, it is battery-powered with a very small footprint so you can easily mount it to any part of your drum rig for accessibility. Plus, with the option of loading in your own custom WAV sounds, loops, samples and backing tracks via SDHC card, alongside twin inputs to support Roland pads and triggers like the BT-1, KT-10 and RT-10 series, the TM-2 is the fastest and most flexible way for acoustic drummers to harness electronic features and create a hybrid kit.